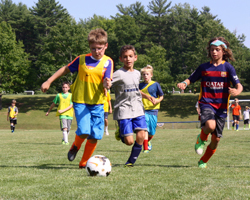 The Player's Academy at Berwick is Seacoast United's premier full day camp during the summer months for players age 7-16. The highest quality instruction will be given to motivated players willing to learn, be tested, and pushed technically and tactically. Players should be ready to experience a learning environment where creativity, confidence, and hard work is expected. Offered during two separate weeks, the Training Academy is preparing for its 6th year on the campus of Berwick Academy in South Berwick, ME. Seacoast United's full time and part time coaches, as well as international staff, current collegiate players, and former SUSC players will mix a high level of play with the right amount of fun to make this the best day camp of the summer! REGISTRATION: Register online for the 2019 Full Day Training Academy by clicking here. EARLY BIRD DISCOUNT! Register before January 31st and save $40 on camp with bus service/$30 on camp w/o bus service! Daily bus service is available from the Seacoast United Indoor Arena in Hampton, NH. For more information on what your child will need during camp week, click here. About Berwick Academy's facilities: Berwick Academy offers first class facilities including 5 well-maintained fields, a top quality field house complete with gym and fitness center, as well as one of the best dining halls in Southern Maine. For more information on Berwick Academy please visit www.berwickacademy.org.